Sometimes, as I look back at my life so far, I think about things that I would change. Things that I suspect would have improved my life had I done things differently. Things, that with the benefit of experience, would make more sense. But there is very little value in looking at things that way. Every time I go down that road, I realize that if I'd done things differently, I wouldn't have something that I now value greatly. Like the butterfly effect. One flap of a wing makes ripples around the world. But one thing that I wouldn't change is marrying my husband (and I'm not just saying that because I know he'll be reading this and is in fact sitting right beside me as I type). He makes almost all the decisions I've ever made make sense. We celebrated our 15th wedding anniversary the other day. 15 years. We got married young, both in our very early twenties. Both completely oblivious to what life would bring. And for us, 15 years together is both mind bogglingly long and feels just right. I am very lucky, people. I scored the jackpot when I met this man. Our decision to marry young horrified some people. I still remember an exchange I had with a random woman on a plane: Twenty-one? I barely knew myself at twenty-one! And it's true, as we grew up, we very easily could have become different people from each other. It could have gone very wrong. And I'm not sure that I would ever encourage my children to get married so young. But it worked for us. We grew closer as we grew up. And as one changed, somehow the other changed too. Our worldview is vastly different from what it was when we got married, but it still jives (he's going to hate that I used that word). It still fits. It still works. For that, I'll be eternally grateful. And while I will take a little bit of the credit for this, it really hasn't been all that much work. We were very blessed to have found each other because we just fit. Life is easy with my husband - aside, perhaps, from the odd perfectionist tendency. And peaceful. Life with my husband is peaceful. Here's hoping that the next 15 years flow as peacefully. That he's still here with me and I'm still here with him. That we've weathered our children's teenage years and SMS. That we can look back with as much fondness as we do these past 15 years. Thank you Brian. I love you very much. Congratulations you two. When it's right, it's right! Brownie's comment: priceless. awww, happy anniversary kids! 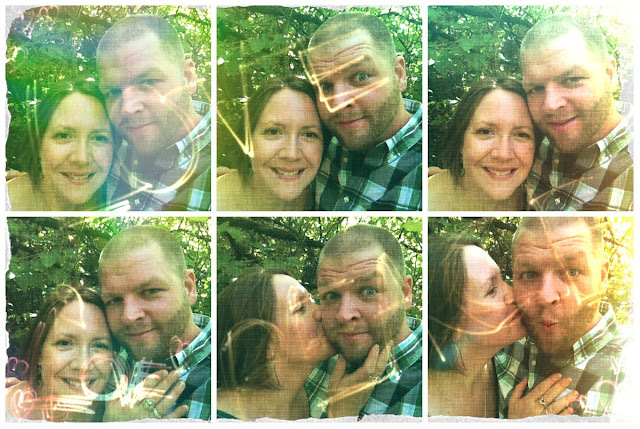 We just hit 14 years a couple weeks ago... and ya, we were practically children when we all got married. But hey, I think we all chose very well!